The real prize, the acceptance letter to UW–Madison, his dream school, travels with him in his backpack, always within reach. All three programs require multiyear commitments: four years for Madison students; three years for Oneida and Lac du Flambeau students. 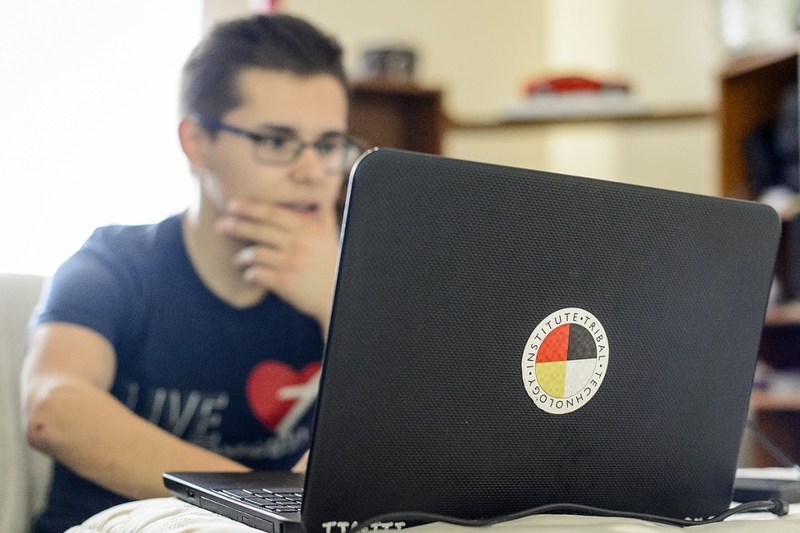 In addition to learning things like computer coding and website design, the students build study skills, develop as leaders, receive one-on-one tutoring, complete internships, and spend considerable time on the UW–Madison campus. The goal is to prepare the students to be competitive in the college applications process and beyond, says Ron Jetty, the academy’s executive director. Acceptance into the program is competitive, and interest is at an all-time high. There were 165 applicants for this fall’s cohort of 30 ITA Madison students. Each of the tribal programs had 15 slots available this fall, and both programs had more applicants than openings. For information on applying for the next available cohort in 2018-19, see the DoIT Academic Technology website. Williams will graduate in a few days from Seymour Community High School, where he’s known as a soccer player, a talented musical performer, and a wearer of wry T-shirts. Many of those shirts reflect a playful boastfulness, like “I Pretty Much Run This Place” and “The Awesome is Strong with This One.” Another says “Straight Outta the Rez.” He doesn’t wear that one to school because he thinks the humor and context would be lost on some of his classmates. Seymour Community High School is a public school of 710 students about two miles from the Oneida Indian Reservation. Paula Tauscheck, an employee of Oneida Nation, is based at the school and provides academic support to American Indian students, who make up about 15 percent of the student body. She calls the UW pipeline program “amazing” in its scope. Students who complete the program and are accepted to UW–Madison receive full-tuition scholarships for four years and become scholars in the university’s PEOPLE program. The students receive no preferential treatment in the admissions process; they must compete equally with all other applicants. Every spring as the school year comes to a close, Tauscheck says she is hopeful yet apprehensive about the American Indian seniors at her school. Even those with really promising futures can sometimes stall out, she says. Tauscheck urged Williams to apply for the program and calls him brilliant. He’s a big video gamer, so the technology aspect interested him. He lives with his younger sister and mother and is considered the techie in the family. Williams says he’s learned a lot through the program about himself and what he might want to do with his life — study psychology, then maybe law, with an eye toward returning to the reservation to help his fellow tribe members. The time commitment is no small thing. The students must complete a blended curriculum of in-person instruction and online coursework that averages about four hours a week during each academic year. There are additional requirements such as weekend trips, summer camps at UW–Madison, and an internship. Over ITA’s history, almost all its graduates have gone on to college, whether UW–Madison or elsewhere. About half have been accepted to UW–Madison as freshmen, and others transfer in later. Williams set aside every Sunday to work on his projects and coursework. He’s been disciplined about his future for a long time, deciding years ago he would not touch alcohol or drugs. He’s stuck to his pledge, he says. In an unexpected bonus, Williams says he met his best friend, Chris Gourd, through the institute. Gourd, 18, a member of the Ho-Chunk Nation, also is a senior at Seymour High School and is graduating this spring from the program. Hanging out in Williams’ bedroom on a recent day after school, the two riffed like a comedy duo. Asked to describe each other, they cracked each other up with jokey responses —“cocky,” “arrogant,” “self-centered”— before turning more serious. Like Williams, Gourd has been accepted to UW–Madison. But he has deferred his enrollment and instead will begin U.S. Marine Corps training in August. Military service runs in his family and exerts a strong pull, he says. This year, of the 37 students graduating from the three programs, all will be going either to college or into the military. Fifteen have been accepted to UW–Madison and 14 have enrolled. Over ITA’s history, almost all its graduates have gone on to college, whether UW–Madison or elsewhere. About half have been accepted to UW–Madison as freshmen, and others transfer in later. There are no expiration dates on the scholarships. Gourd laughed but didn’t disagree. 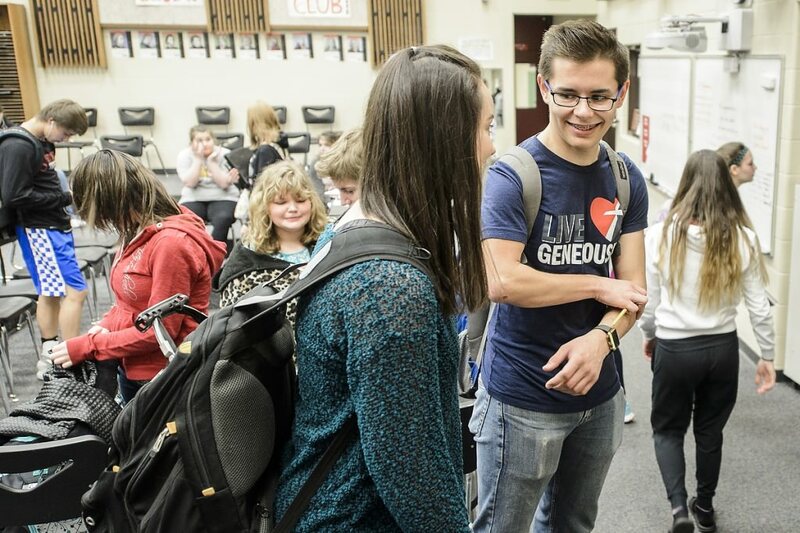 He may end up at UW–Madison one day, he says, but for now, the timing’s not right. Both young men, despite their self-deprecation and feigned arrogance at times, are incredibly diligent and talented and have their hearts and minds in the right place when it comes to academics and their communities, Kilgour says. “I could not be more proud of both boys — all of the students, for that matter — and the things they’ve accomplished and the obstacles they’ve overcome,” Kilgour says. A couple hours farther north, Kenadi Mayo, 18, another participant in the UW program, is finishing her senior year at Lakeland Union High School in Minocqua. The public school enrolls just over 700 students, about 20 percent of them American Indian. Mayo, who is Chippewa, lives on the Lac du Flambeau Indian Reservation about 15 minutes from the school. She’s soft-spoken, but the outward reserve masks hard-core determination. “I do what needs to be done,” she says. A multisport athlete, she’s a 6-foot-tall standout in volleyball and the team’s co-captain. This summer, she will play on the volleyball team representing Wisconsin at the North American Indigenous Games in Toronto. It is the second time she’s been chosen for the honor. For one of her multimedia assignments in the institute, Mayo compiled video highlights of her high school team’s volleyball season. She enjoyed much about the institute, she says, but is relieved to have it behind her. As with Williams, she found it challenging to balance the coursework with her other commitments — sports, Model United Nations, Spanish club, DECA, homework in her advanced-level classes. She is interested in business and marketing and has been accepted to Arizona State University and DePaul University in Chicago. She was not accepted to UW–Madison, her first choice, so instead has enrolled at Madison College this fall. She hopes to transfer to UW–Madison her sophomore year, at which point she would be eligible for a full-tuition scholarship for her remaining three years. Williams will be the class speaker for the graduating Oneida students. Liliana Teniente, 18, a senior at Madison La Follette High School, will speak on behalf of the Madison contingent. Mayo’s mother, Dee Allen, says she appreciates that her daughter, through the program, has become comfortable with UW–Madison and what it offers. She hopes the familiarity will address a frequent problem she’s noticed. Jetty agrees that continued support in college will be valuable.